I’ve been listening to a bunch of Zig Ziglar recordings lately. I don’t know about you, but that quote really causes my “the-whole-world-revolves-around-me syndrome” to flare up.My default mode for dealing with people is to first ask “What’s in it for me?” Sure, I want to help the person, but my top priority is how JOE is going to benefit from this interaction. If Zig was right (and I believe he was), then focusing on myself makes me far less likely to get what I want. It is both ethical AND productive to focus on helping the other person first. So what does that look like for you and your music? How do you approach potential clients or collaborators? What would it look like to be more concerned with helping THEM make great-sounding music than getting whatever it is you want? It would be game-changing, wouldn’t it? Your recording skills would advance by leaps and bounds. And in a weird way, your mixes could benefit from selflessness, too. Rather than make the mix sound like YOU want it to sound, perhaps you need to set aside your desires and let the mix “tell you” what it wants. Not everybody agrees with me. Heck, I think even Graham and I disagree on this a bit. 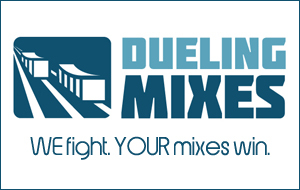 We talked about it all on this month’s Dueling Mixes webinar.